These system requirements are recommended for a Microsoft Windows host and vary for different releases. Please contact us for more information about minimal and recommended requirements for Linux, QNX Neutrino RTOS, and Windows hosts. 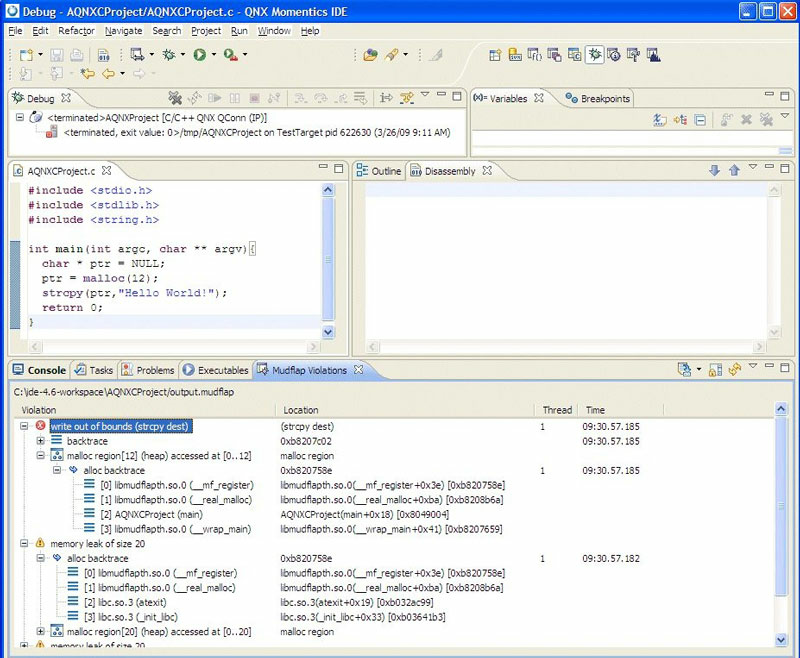 The QNX Momentics Tool Suite offers all the development and debugging features commonly found in other Eclipse-based IDEs, plus unique QNX capabilities, such as multicore profiling and an instrumented kernel. Eclipse provides well-defined interfaces to ensure that tools work together seamlessly. All tools share the same look and feel, so developers only need to learn one user interface. Developers also benefit from an open, extensible platform for tool integration supported by a large and rapidly growing community of tool vendors and developers. They can plug in third-party tools, or build their own plug-ins using the industry-standard Eclipse framework. 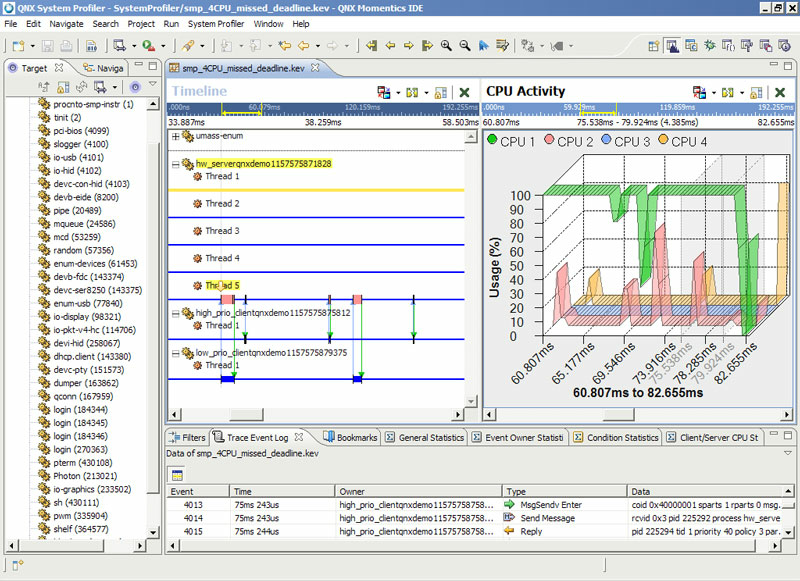 The QNX Momentics Tool Suite's unique tool set facilitates not only debugging but also performance optimization. Tools such as the system profiler and application profiler let developers pinpoint where — in both single-core and multi-core systems — optimizations will most improve performance, while tools such as the code coverage tool and mudflap provide everything necessary for building the most robust and reliable embedded systems possible. The QNX Momentics Tool Suite even offers the flexibility to work with a mix of languages and processor architectures simultaneously. The Foundry27 community portal for QNX software developers provides source repositories, forums, blogs, wikis, and, in the community spirit, a bazaar that lets developers exchange information and ideas, and share source code and binaries. The QNX Momentics Tool Suite provides an optimized environment for C and C++ development. Developers can work in either a command-line or a graphical IDE environment, and take advantage of many productivity features, such as wizards, code editors, and flexible makefile structures. Project wizards - Built-in project wizards automate the entire project-creation process. The QNX Momentics Tool Suite code editors offer a large set of the most useful time-saving features, including cut-and-paste, undo, commenting, highlighting, and language-specific indentation, and user-defined preferences. 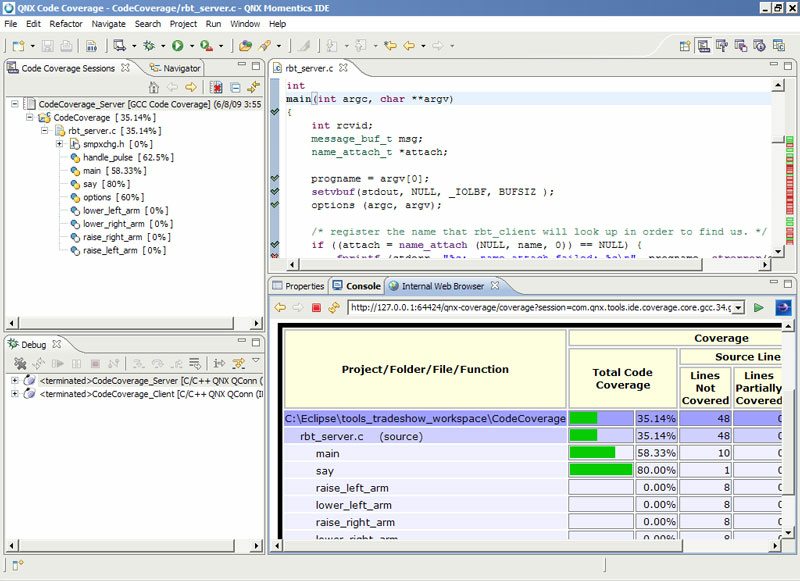 The IDE uses both embedded and external editors. When a user opens a file, the IDE launches the embedded editor associated with that file. If no embedded editor is available, the IDE attempts to launch an appropriate external editor. Using editors, developers can implement a content-assist feature that offers function-name suggestion and completion, display of function synopses, arguments, and required headers, and insertion of all required "include" statements. Content assist feature - The content assist feature suggests and completes function names, and displays synopses, arguments, and required headers. Developers can fold (hide) sections of code they are not working on. This folding includes mixed folding, which lets users designate code subsections that will remain visible even when their parent section is folded. Using a single keystroke, developers can insert commonly used code constructs, such as exception-handling blocks or "for" loops. Each editor comes with predefined templates that can be edited or cloned. Editors display markers associated with the current file, including breaks and errors generated by the build tools. A simple click on the marker indicates the offending line. Developers can also insert markers to serve as task reminders or bookmarks. The source navigator supports context-specific searches for references and definitions, outline views for fast navigation of source code and project header files, and jumps to functional declarations and prototypes. The IDE editors maintain local history that facilitates temporary debugging changes. Developers can set editor preferences to automatically keep multiple revisions of working files, compare versions, merge versions, or undo changes. The IDE allows developers to configure build settings such as compiler and linker options, extra includes, and libraries. 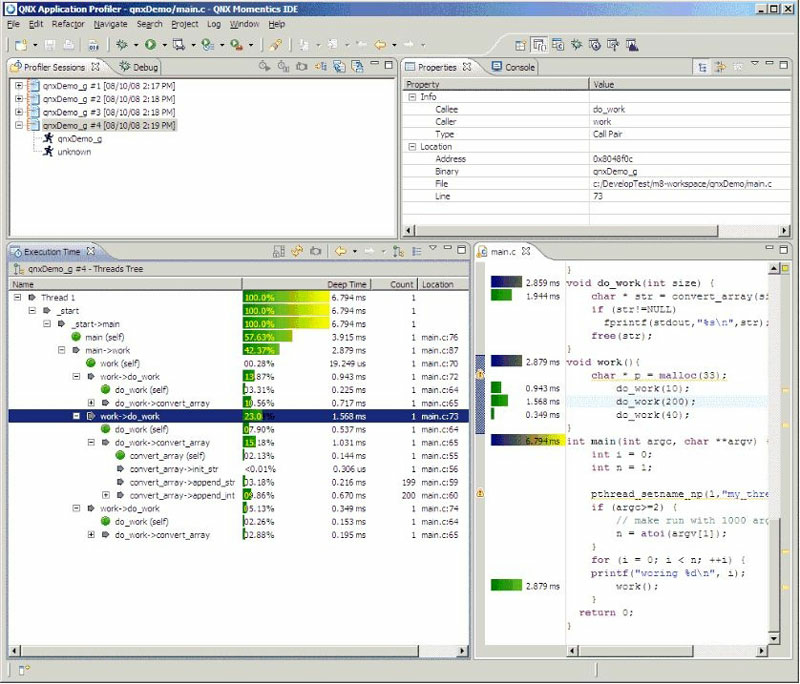 The IDE eliminates the need to handcraft makefiles for multi-processor environments. A point-and-click interface lets developers build what they need for the environment, including targeting one or more CPUs and building multi-processor, recursive makefile frameworks. The IDE saves the build settings in a conventional makefile format. Developers can reuse existing projects based on makefiles or port projects based on a build command other than make. Developers can build, run, and debug with a single click. Using the launch configuration wizard, they can also quickly specify which programs to launch, on which targets, and with what debug options. 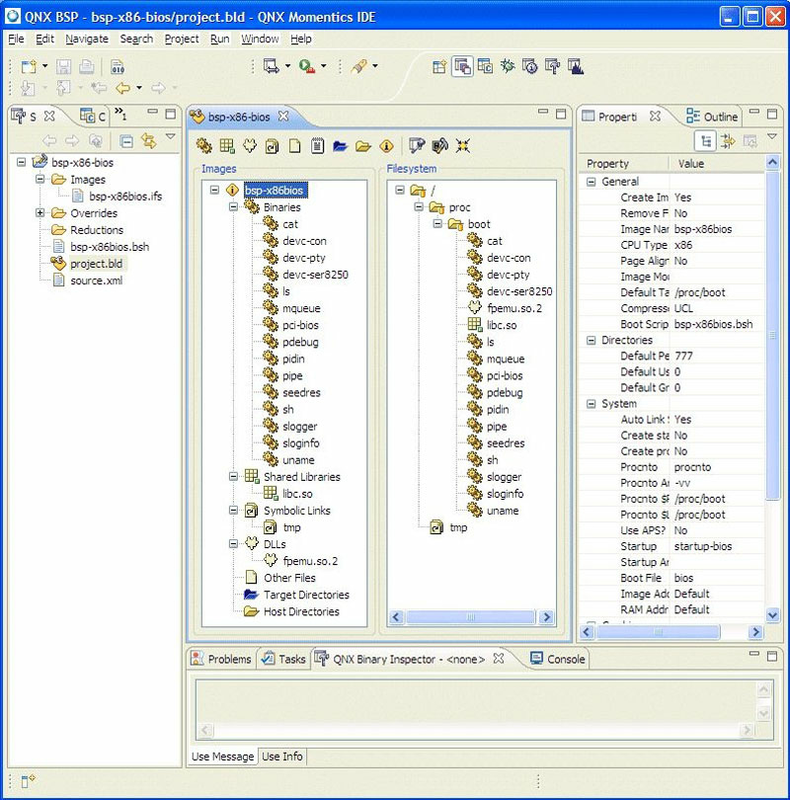 The IDE supports launch groups that allow multiple applications to be downloaded and launched at the same time, or in a user-determined sequence. The IDE remembers launch group preferences, so launching subsequent sessions are quick and easy. Version and configuration management are built right into the IDE framework so there is no need to switch out of the IDE to manage source code. Developers can work in a heterogeneous source-control environment using different source-control protocols for different projects — even for different files in a project. Configuration wizard - The configuration wizard lets developers quickly specify which programs to launch on which targets and with what debug options. The QNX Momentics Tool Suite includes a unified debugging environment that is completely integrated with the other tools in the suite. It offers developers the flexibility to best address the problems at hand regardless of programming language. The QNX Neutrino RTOS includes an instrumented version of the microkernel with a sophisticated tracing and profiling mechanism for real-time execution monitoring on both single processor and multi-processor systems. Working in the IDE, developers can configure all trace events and modes, then transfer log files automatically to a remote system for analysis. The instrumented kernel uses very little overhead and gives exceptionally good performance. It requires only about 30 kilobytes of additional memory, and is typically about 98% as fast as the non-instrumented kernel when it isn't logging. Thanks to this low overhead and high performance, many users choose not only to use the instrumented kernel during project development and prototyping, but also to deploy it in the final product — greatly improving their systems' post-delivery diagnostic and debugging capabilites. The instrumented module is non-intrusive — there's no need to modify a program's source code in order to monitor how that program interacts with the kernel. The application profiler samples execution at regular intervals to help developers pinpoint inefficiencies in applications and shared libraries. This method requires no instrumentation, code changes, or special compilation, and ensures that the profiler doesn�t contaminate the information it collects. The application profiler does not require instrumentation and has low overhead. Sampling can be reset without restarting applications, so developers can easily compare results under diffferent loads. To obtain exact execution counts, the compiler can instrument the compiled code for profiling by the application profiler. This code reports function calls and call-pair (caller-called) information. Once call counts and execution statistics have been used to pinpoint bottlenecks, developers can use the IDE�s navigable call graph to find the callers and ancestors of a function — great for identifying where best to optimize code. QNX application profiler - The application profiler helps developers quickly answer the question: "Where can I optimize?" After an initial port to a multicore system, developers can use application-profile analysis to rapidly isolate code for parallel execution. For example, a CPU-intensive signal processing routine will stand out in an application profile; breaking this routine into several multi-threaded routines will permit parallel execution in a synchronous multiprocessing (SMP) system. 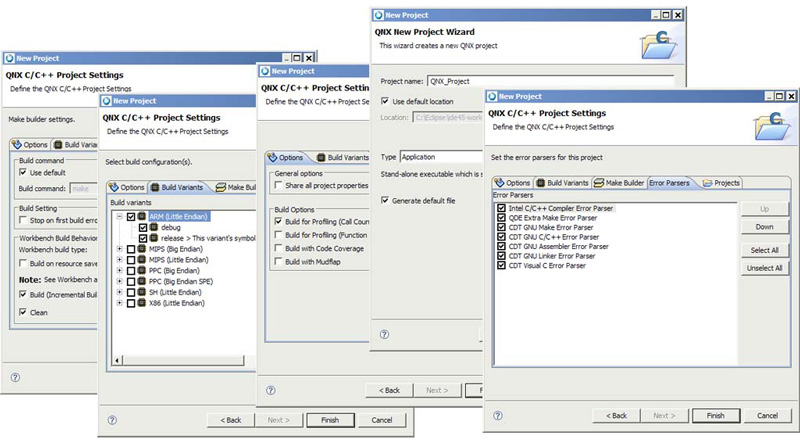 QNX system profiler - The system profiler works with the instrumented kernel to help pinpoint areas for optimization. QNX code coverage tool - The code coverage tool is invaluable for stringent and complete testing, and produces report-ready results. Code coverage is an essential tool for project environments that require stringent and complete testing. It can also be useful when bug fixing and software maintenance are handled by separate teams who may not be involved in the original code development, and who may even be located in different parts of the world. QNX Mudflap support - The QNX Momentics Tool Suite has integrated Mudflap support, which allows developers to quickly find pointer errors in code. The QNX Momentics Tool Suite offers a complete tool set for transferring boot images and files to target hardware, and for gathering important information from the target for diagnosis and debugging. QNX target system builder - The QNX system builder gives developers the means to visually edit boot image layouts. To transfer a build image to a target, the system builder can either use its built-in serial terminal, which can talk to remote ROM monitors, or transfer the image via TFTP or BOOTP. After the target is up and running, developers can use any number of mechanisms for additional development and file transfers. They can, for instance, use the IDE's file browser to directly edit and update files on the target. 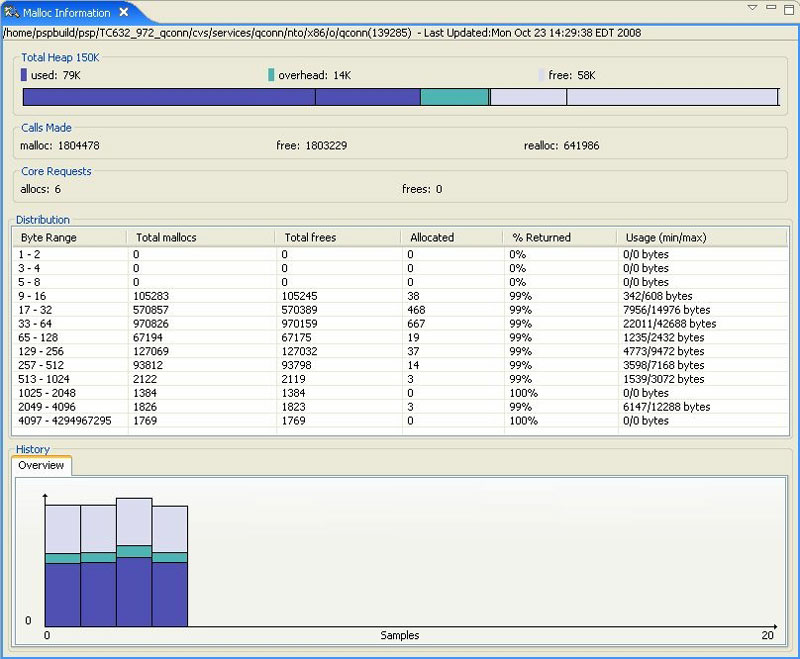 The QNX Momentics Tool Suite includes a unique, extensible target-agent architecture that supports multiple target tool service interactions, such as launching, debugging, profiling, and information gathering. The target agent enables any tool in the IDE to communicate with the target. When the host system activates a service, the target agent loads a corresponding module on the target. When the service is no longer required, the target agent removes the service, keeping the target's footprint to only what is required. Like any QNX driver, the target agent can be dynamically started and stopped as needed. New tools can use the target filesystem navigator as an extension point to add their own actions to the target system context menu. Such actions may include generating a signal for a process on the target system, or attaching the debugger to a running process. QNX target navigator - The target navigator lets developers drag and drop files to and from the target. QNX target system information tool - The QNX target system information tool provides developers with high-level and detailed information about target systems, right down to thread attributes. The target system information tool offers developers high-level overviews of an entire target system, and detailed information about processes and threads. For example, developers can start with a high-level overview to determine which processes are active and identify the arguments being used for them. They can then view CPU and memory usage, both for the system and per process. Finally, they can drill down as needed to examine thread attributes (state, scheduling policy, CPU usage, stack size) signal states, program memory maps, file descriptors, and so on. The QNX Momentics Tool Suite continues to evolve. The last release (4.7) became generally available with the release of the QNX Software Development Platform 6.5.0.